Unrelenting wild beasts that take your soul; Leviathan, the great impenetrable and unhookable, multiple-headed sea monster that generates world-wide havoc; poisonous arrows that sink into your skin; the mighty, muscular, illusive, Behemoth who eats and eats everything in sight and fears nothing; the roar of tsunami waves washing over your head – these are relentless terrors of the soul experienced by those in the midst of great suffering. The terrors are so great they feel supernatural, and they are. They are the terrors attributed to Satan. The Apostle Peter warns of Satan, “Be sober-minded; be watchful. Your adversary the devil prowls around like a roaring lion, seeking someone to devour,” (1 Peter 5:8). The Apostle John moves us from images of ferocious African creatures to the stuff of fairytales when he says, “the great dragon was thrown down, that ancient serpent, who is called the devil and Satan, the deceiver of the whole world,” (Revelation 12:9). They are the terrors the Bible attributes to God. the arrows of his quiver;” (Lamentations 3:10-13). The terrors belong to the Only Good God. ‘therefore I will hope in him,” (Lamentations 3:22-24). The psalmist who had experienced the waves of God rolling over him urged, “Hope in God; for I shall again praise him, my salvation and my God,” (Psalm 42:11b) God described himself as a lion that would tear his people to pieces (Hosea 5:14), but then Hosea said of this terrifying but good God, “He has torn us, and He will heal us; He has wounded us, and He will bind up our wounds,” (Hosea 6:1). 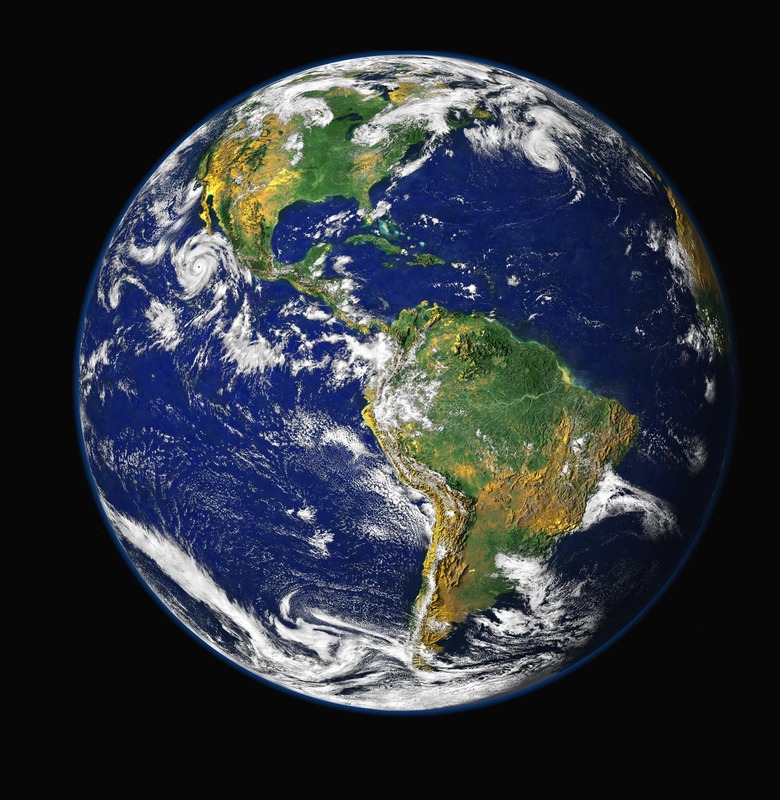 For by him all things were created, in heaven and on earth, visible and invisible, whether thrones or dominions or rulers or authorities—all things were created through him and for him,” (Colossians 1:16). The terrors are under God’s control. Asaph knew the terrors were under God’s control when he said, “You crushed the heads of Leviathan; you gave him as food for the creatures of the wilderness,” (Psalm 74:14). Isaiah knew this when he prophesied, “In that day the Lord with his hard and great and strong sword will punish Leviathan the fleeing serpent, Leviathan the twisting serpent, and he will slay the dragon that is in the sea,” (Isaiah 27:1). This is why Asaph could plead, “Do not deliver the soul of your dove to the wild beasts,” (Psalm 74:19a). This is why Ethan the Ezrahite could write, “You rule the raging of the sea; when its waves rise, you still them,” (Psalm 89:9). God himself speaks this truth when he says of the Behemoth he created, “let him who made him bring near his sword!” (Job 41:10b). These terrors are expressed in poetic form over and over throughout the Bible, so my two prose poems below are not unique in their subject matter. Like biblical poetry, they are meant to express something of the terrors that are felt during times of severe suffering. For me, they express the experience of watching a child suffer through the ravages and treatment regiments of childhood cancer. For you they may describe another type of suffering. They are also meant to express or evoke images of Christ’s suffering on the cross just as much biblical poetry that describes terror does. As you read these prose poems, I hope that you will feel something of the terror these sufferers feel, or perhaps your own suffering has brought you to a place where you can already identify with them. I hope they will help you experience the cross in a deeper way. Through these poems, I also hope you experience the hope of those who trust in the goodness and power of the Lord who is over the terrors. Hell has unhinged its door, and its icy-hot draft glazes our skin as it settles on you and tries to seep into your blood. Soon Satan’s shadow will slide through the crack and across this wretched room before our shivering stops, before infernal flames ignite emotions that could let loose a flood. He is the torturer giving orders, intent to make us watch while he waits outside to see what will happen when you get worse. You will get worse – even worse than we think possible, and we cannot fathom how your tiny frail body, more fragile than an infant, could survive this incessant malevolent curse. Yet you keep coming undone, and we stare in disbelief and wonder if morning will break for you, and so we watch with weary eyes. But each moan and groan will drag out our wait and drape our hope while God watches too, determined in a will that will anchor us and douse our urge for anxious cries. Satan snaked into your world with stealthy zeal to steal your praise and did not fathom that from his scheme your glory would beam more fiercely than before. He once had thoughts to stop you, but there you are, with all that ugly sin pinned and dripping on your battered bloody skin hanging on the peg of his very door. You see him, the prince of light, the ruler of this world, touching finger to crown and shifting feet on his ground for guilty accusation. We do not know it yet, but he must release us if you die, and, when you die, we will hang between past and future and wonder how we will escape infernal eternal damnation. Meanwhile, God had drunk each drop of hallowed blood that bled into that dreaded cup your sweaty spiked hand gave him and smiled with satisfaction upon his drape of justice, upon redemption won. We stare, still in disbelief, because morning broke for you and we cannot yet comprehend that everything has been redone. 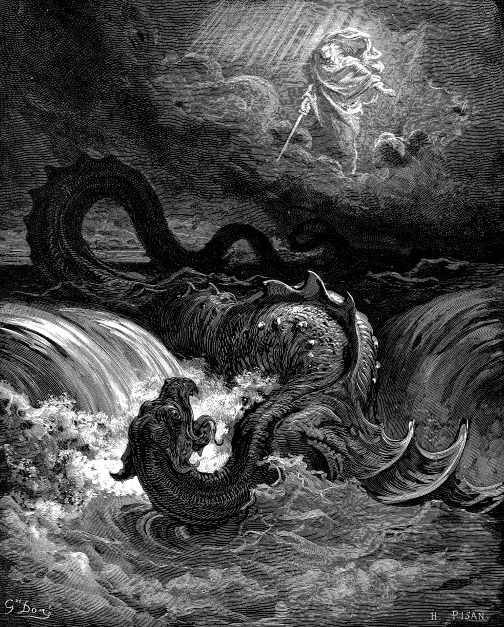 The picture is a photographic reproduction of the engraving, “Destruction of Leviathan,” by Gustave Doré, 1865, Photo and Engraving in Public Domain, accessed September 6, 2014 from Wikimedia Commons. Eason, Pamela, “Will You Live or Will You Die?” and “You Will Love and You Will Die,” Images of Cancer and the Cross, an unpublished work, Copyrighted ©biblestudygirl, August 2014.